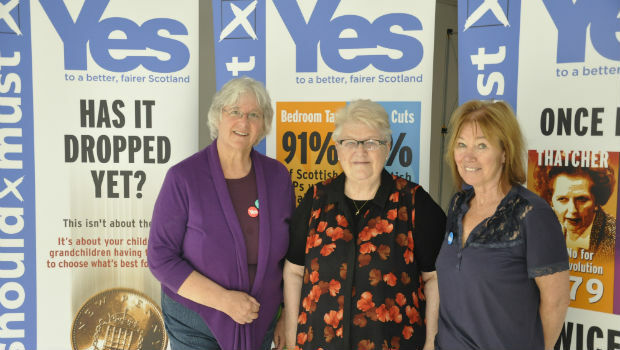 Yes campaigners are opening an information hub and shop in the centre of Dunfermline. With less than 100 days to go until Scotland’s independence referendum, West Fifers are being invited to drop into the shop at Bruce Street from this Thursday to chat about the issues and pick up information to help them make their decision on September 18. The shop will be open 11am to 4.30pm Monday to Saturday, with extended opening to 7.30pm on Thursdays. Special events will also be held at the premises at various times, including parents’ sessions with toys and entertainment provided for young children and training sessions for those looking to get involved with the Yes campaign. A group of mainly female local volunteers from a broad background of political parties and none will staff the shop, led by a very well-kent face around Dunfermline, Pars stalwart Marv Stewart. Marv, who set up the Pars United DASC shop and has raised more than £28,000 for Pars United, will use her expertise to ensure a range of merchandise is on offer as well as the premises being used as a safe and welcoming drop in centre for anyone looking for more information on what a Yes vote would mean for Scotland. Information from Yes Scotland as well as other groups campaigning for a Yes vote, including Labour for Independence, Scottish Greens and Women for Independence, will be available alongside merchandise which will be sold to raise funds for the campaign locally. The shop will be open for business from Thursday morning, with an official opening event taking place on July 2 with writer and broadcaster Lesley Riddoch speaking about her inspiring book Blossom: What Scotland Needs to Flourish, which relates stories of Scots who have struggled against the odds to improve their communities. The Bruce Street store is one of a growing number of Yes shops popping up across the country as people look for more information ahead of the referendum vote. Dunfermline will also play host to several public meetings aimed at undecided voters in the coming weeks, with Tommy Sheridan and PCS trade unionist Fiona Macdonald for Yes joining Willie Rennie MSP and Cllr Dave Dempsey for No to put their respective referendum arguments to the public at Abbeyview Community Centre on June 24 at 7.30pm. Nicola Sturgeon will speak at an event in the Glen Pavilion on July 4 at 6.30pm, and a further debate will take place in Duloch in August with speakers to be confirmed.